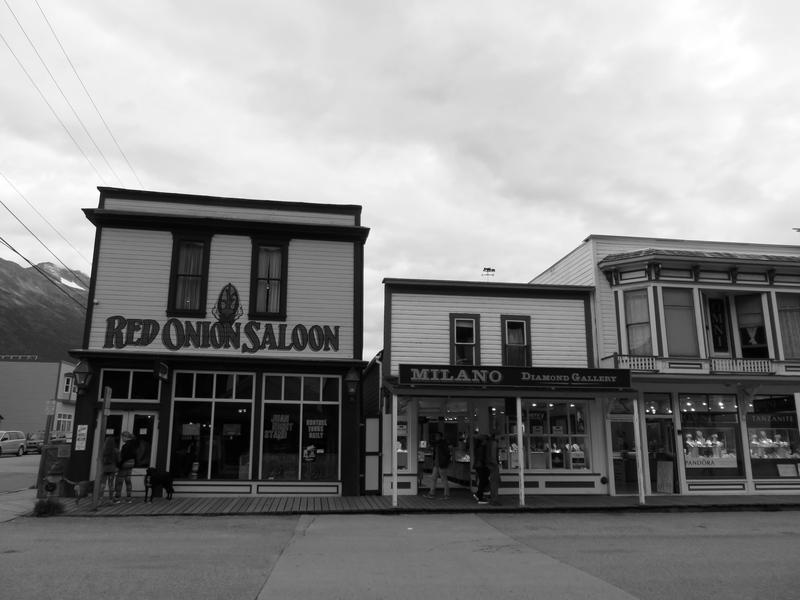 I didn’t really know what to expect when it came to the coastal towns of the Alaskan Panhandle. In fact, I barely did any research before I set sail for the great white North (so unlike me). It did, however, make for a very exciting week of adventures as I discovered each town first with my eyes instead of through a screen. 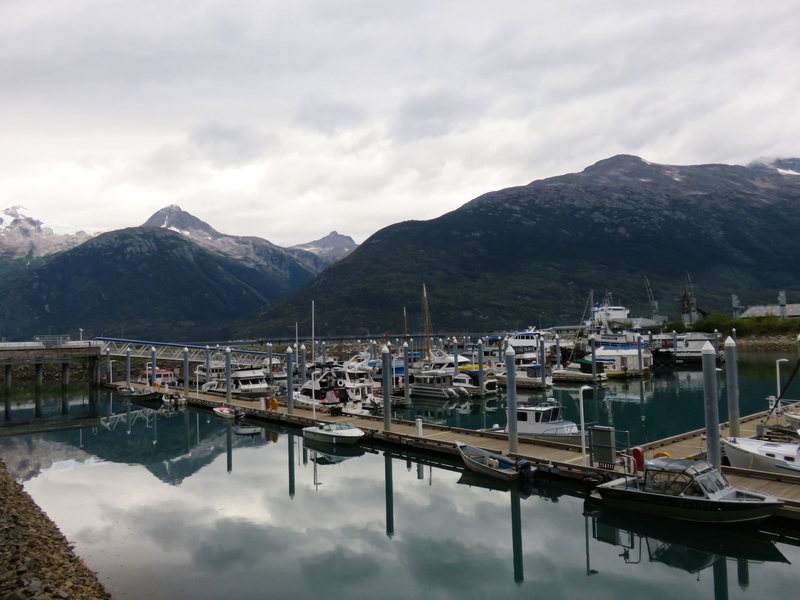 Port of Skagway – so pretty! 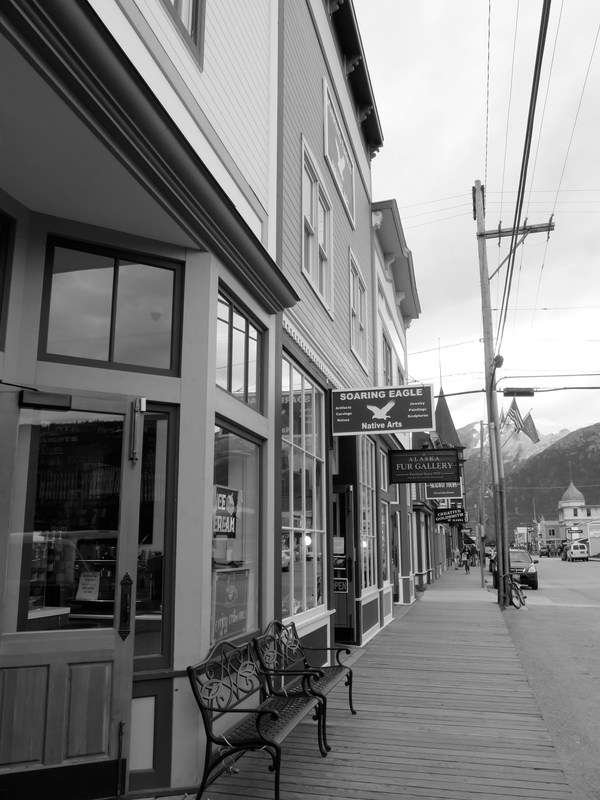 Our second port was historic Skagway. 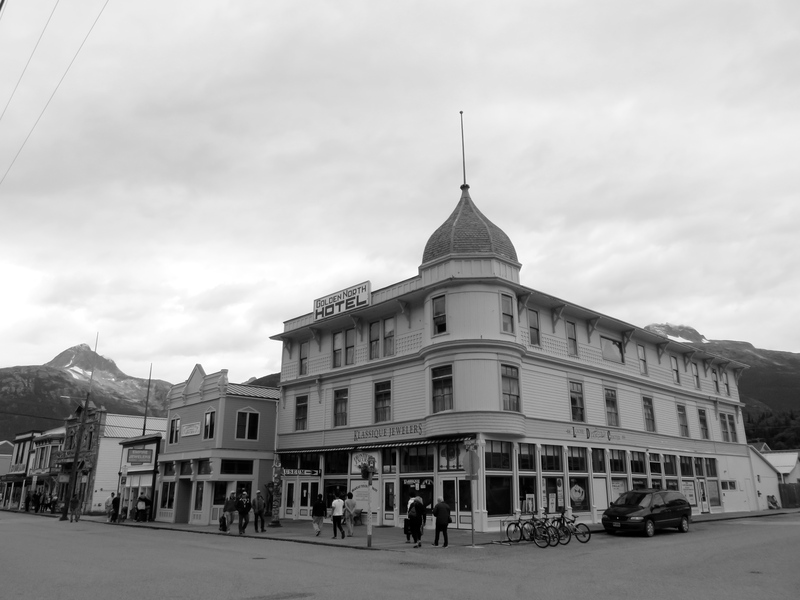 This gold rush town looks straight out of a Western movie complete with a restored boardwalk, saloons, and brothels. We were soon to find out that for a town with a permanent population of less than 1000 people, it sure has a lot going on. Back in time to the Gold Rush era! 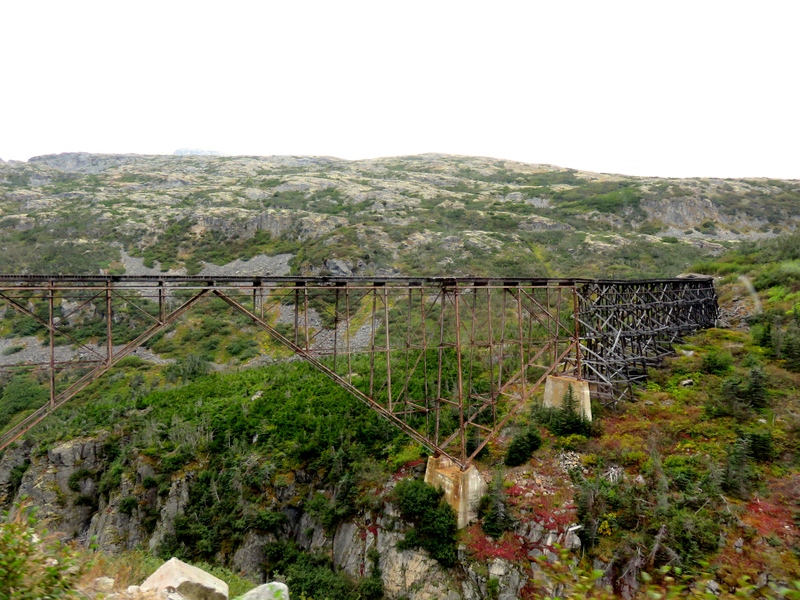 The one thing that I did know about Skagway before I got there was that it had a railroad. 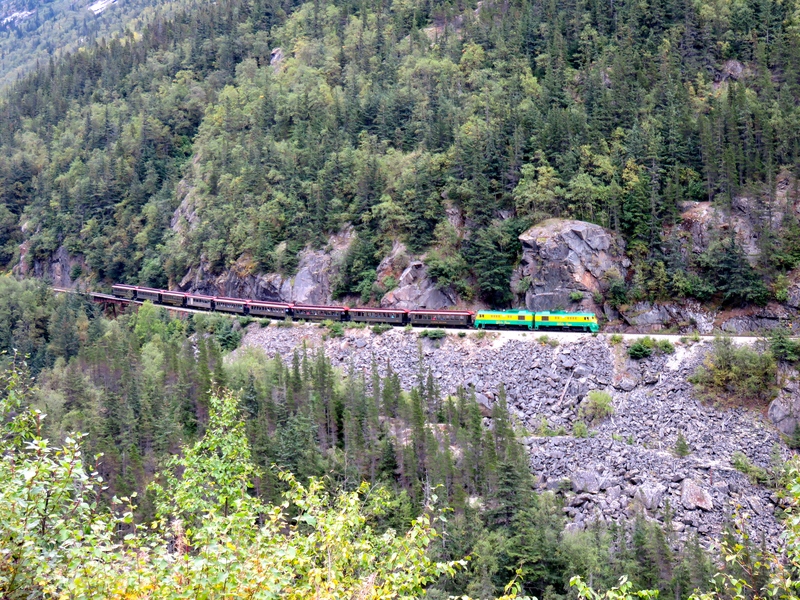 And if there’s one thing that I love… it’s sightseeing by train. 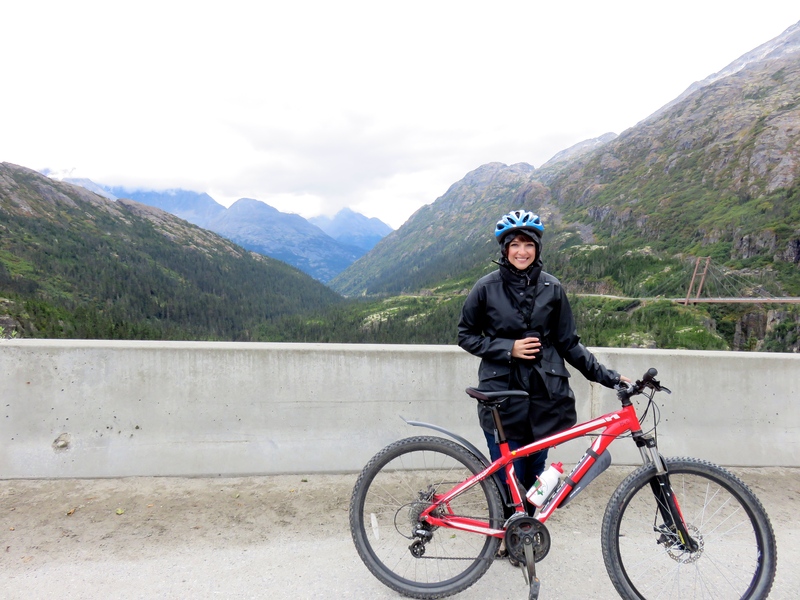 So of course it was a complete no-brainer in my books to join Sockeye Cycle for the White Pass Train and Bike Tour. We met our guides straight off the cruise ship and had a quick spin around the town before boarding the White Pass Rail. 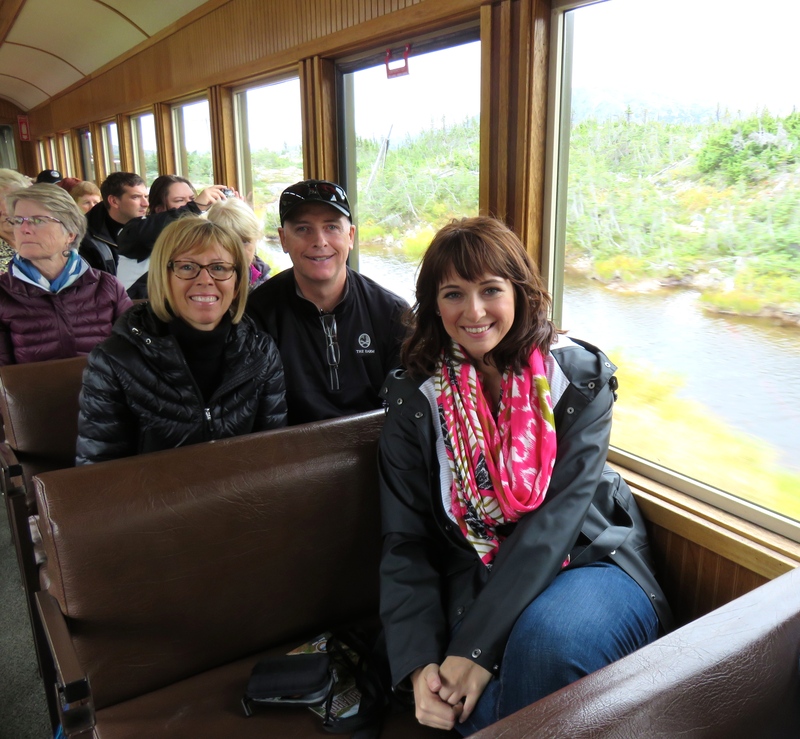 I was instantly in my happy place, thoroughly enjoying the beautiful scenery and fascinating gold rush trivia from the comfort of our vintage passenger car, complete with wood burning stove. 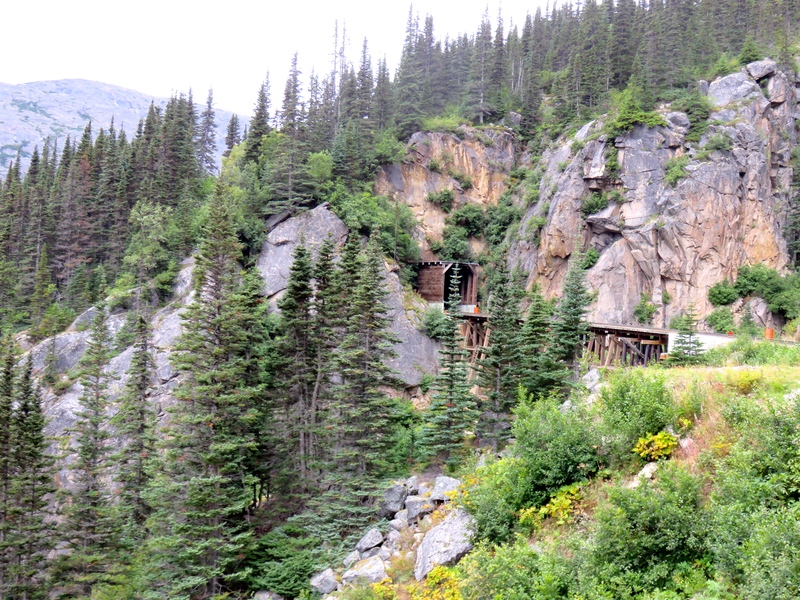 Our 20 mile journey took us from sea-level to nearly 3000 ft and across the Canadian border to Fraser, BC. 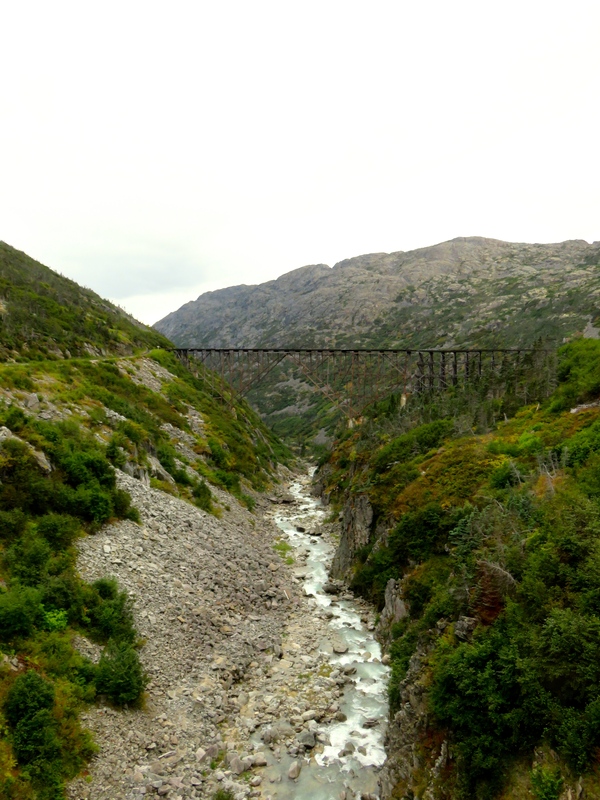 On our way we passed through tunnels, over sky-high trestles and beside cascading waterfalls. One of two tunnels we passed through. I even rode through this one on the outside balcony! But, this trip was not about the destination – it was time for the return journey – this time by bike! Another guide met us at the summit with our bicycles and after a safety orientation we bundled up for the windy ride down. 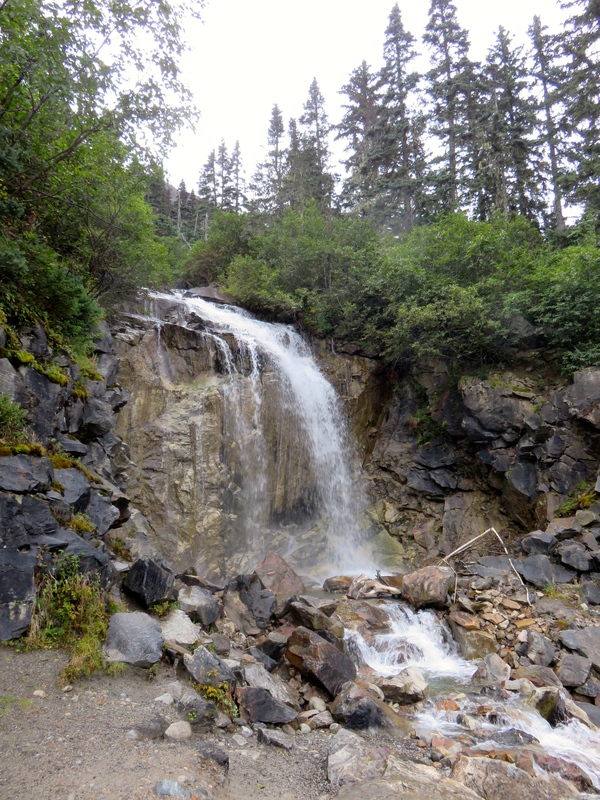 We glided 15 scenic miles downhill, stopping multiple times along the Klondike Highway to enjoy Alaska with all of our senses fully engaged. 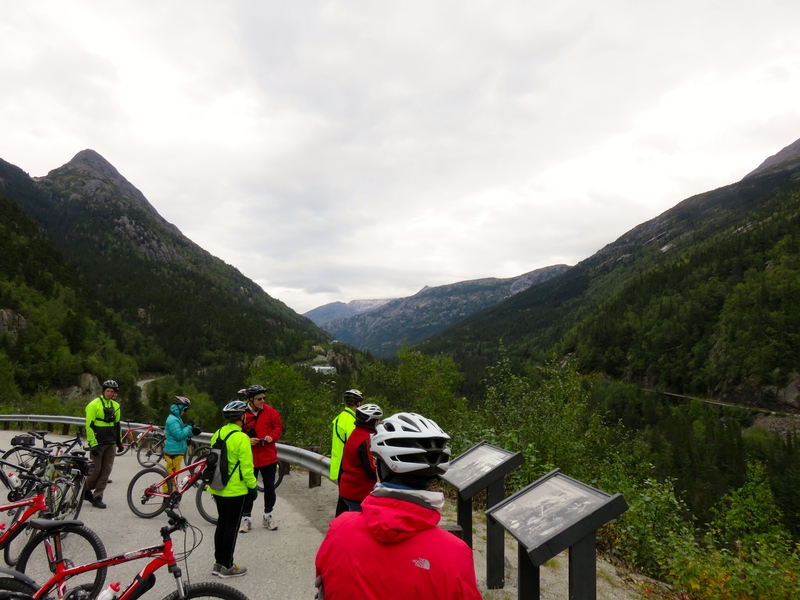 We coasted down the mountain at speeds of 15-25 mph – definitely the fastest I’ve ever gone on a bicycle and far more exhilarating then the way up. We even got to ride our bikes back across the US border – how many people have done that?! Possibly not the proper way to wear a helmet – but I kept my ears warm! 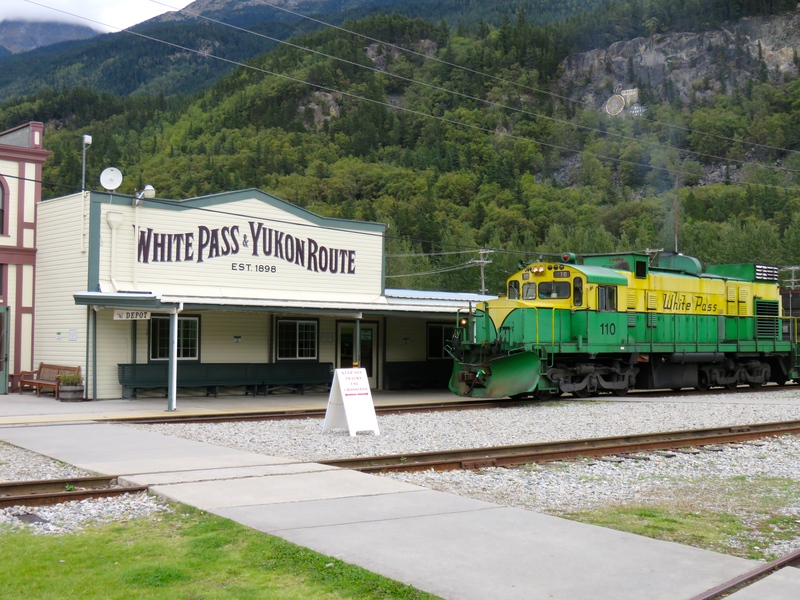 Built in 1898 during the Klondike Gold Rush, this narrow gauge railroad is an International Historic Civil Engineering Landmark. Thought it’s only used for tourism now, it played a very important piece in the life of the early settlers. My whole family had a great time on both the train and bike ride despite the initially chilly temperatures. It’s a great way to check out the scenery, get some fresh air, and learn a bit more about the fascinating history of this wild land. No wonder it’s the most popular shore excursion for cruisers! What’s the best train route you’ve been on? 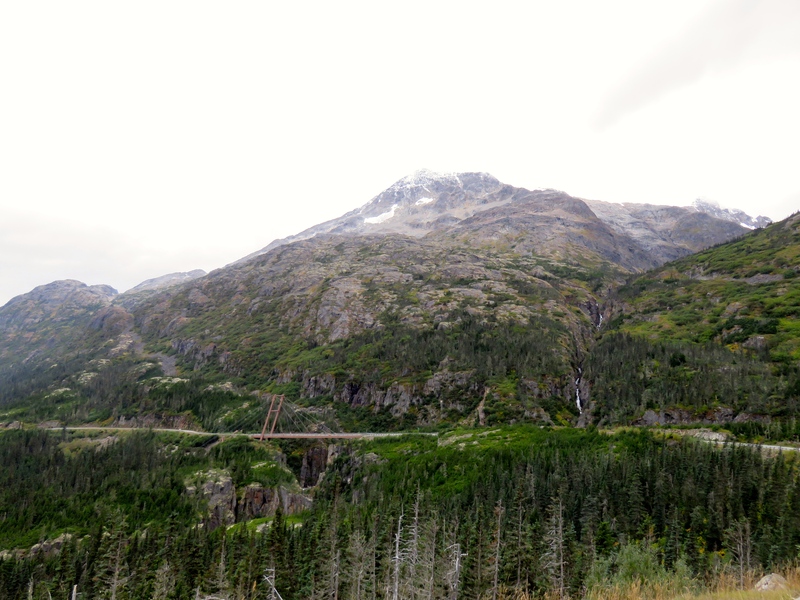 This entry was posted in Alaska, North America, USA and tagged Alaska, bicycle, Bike, Railway, Ride, Skagway, Sockeye Cycle, Train, White Pass. Bookmark the permalink.